Location: Eastern, CO south of Brush. Summary: Storms fired early along a boundary from near Dear Trail to Peyton, CO. I headed south from Elizabeth toward the Peyton cells. Landspouts formed near the Dear Trail cells and the Peyton cells only produced penny sized hail. I headed toward Limon to top off my fuel and then joined up with Zach Young northbound on Hwy 71 to check out the boundary near Brush forming storms. About 15 miles south of the main updraft of the storm we were approaching a funnel formed and then dropped to the ground. This tornado only lasted a few minutes and had a very snaky rope out with an elongated funnel. Soon after another tornado formed and I was in perfect position. 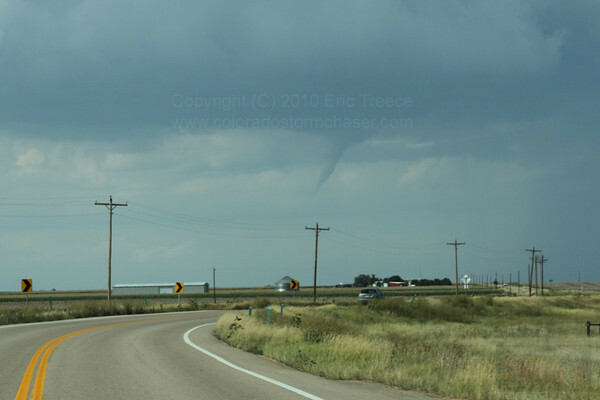 I turned back around as I had already passed this tornado (It must have formed as I was driving under the updraft). I drove back south and got some extraordinary video of this tornado. It lasted roughly 5 minutes. Afterwards, I hooked up with a few other chasers at the truck stop in Brush and we had celebratory steak dinners. After dinner we walked out and there was a gorgeous shelf cloud approaching us from the west. I took a couple shots of that and then called it a day. Pretty awesome experience! !